Feeling good today, and loving it. Getting lots done… loving that. I don’t know how long this will last but hey, I’ll take it while I have it. Last night we had a great time at the Lawrence’s house. Yesterday morning I went and visited my new Cambodian friends near church, and saw photos of Cambodia, their weddings, the kids, etc. I loved that. Anyhow, time to keep cranking on getting stuff done, and hopefully even blog more! “The limited”… my new name for those of us limited by circumstances beyond our control. (Believe it or not, I’m not talking about infertility here, though I could!) Those of us unable to do the things we would like to do, and people our ages and phases of life should technically be able to do….but can’t, because of the way life is. Granted, on some days I self-limit. I don’t want to do anything, I feel lazy, maybe I’m afraid of taking some steps with something…. That happens occasionally. But on days like yesterday, fibromyalgia’s the culprit. I fall into the category of “the limited” thanks to fibro. I experience fibro pain on most days, but it’s not usually so limiting. But then I have days like yesterday, when I wake up knowing it’s going to be a bad fibro day. The pain is intense: my arms and hands hurt, my entire body aches, it literally pains me to even lift a coffee cup. I’m painfully aware that I cannot do everything I’d like to do, and it’s frustrating beyond belief. I’m too young for this. It’s not fair. Yet I’m also grateful… grateful that my fibro is not as bad as it could be. Grateful that I am able to do so many things on the good days, which far out-number the bad days. And grateful that God has given me the strength to do what I need to do, when I need to do it. Mostly. I still grow frustrated at my own limitations. But I’m also aware that there are too many people in our world who are limited by much worse than my level of fibromyalgia. Things like extreme poverty, racism, sexism, lack of education, being the victim of a horrible crime or accident… these, and countless other circumstances, are horrible… I can’t imagine the extreme limitations some people push through everyday. That’s someone else’s term, coined about this past Sunday. God was gracious in helping me preach with confidence, and not with anger and frustration as I looked out into the congregation and saw two beautiful babies and one woman recently pregnant with her fourth child. Baby Sunday. I preached, and I said hi afterwards, and I was pastoral, except a little avoidance –ok, maybe a lot of avoidance–of the mass of people surrounding the visitors (former members) with their new baby. Mass of people. Wonderful, yet hard. I talked at length about this issue with the visitor–both before her visit (via email) and on Baby Sunday. We had a great discussion, both with tears, because we love each other, we are friends, but also acknowledge how hard this baby/no-baby issue is for relationships. Except for needing to avoid the mass-surrounding-babies after church, I did pretty well. I actually thought I did quite well, all things considered… But it hit me later. When I was watching a movie Sunday night, I found myself crying more than necessary for the movie I had already seen three times.. I realized, “A-ha.. this is about Baby Sunday.” It hit me that yes, as well as I did, I still need to have a good cry sometimes. It hit me that this wait for China is harder than I’m letting myself acknowledge day-to-day, as I move forward with the rest of life. It hit me that I’m still quite angry at God for giving Jim and me this curse of barrenness. And yet I’m grateful that God is also helping me get through these times. I don’t know how..
My friend expressed concern about church growth… if I have a hard time with babies, then how could our church have lots of young families? Could we? Yes, I said. We do, and we can. I love babies, I love children. (Which is the problem. If I didn’t love babies so much this wouldn’t be so difficult.) I am able to be pastoral. It’s just hard, mostly with babies. If she had seen me last week at Vacation Bible School, I told her, she would have seen me holding kids, carrying kids, letting kids crawl all over me. And enjoying it. And if a family with a new baby or pregnant lady enters our church, I will welcome them as I would any other new family. So I’m not concerned about church growth from that perspective. But it doesn’t mean it’s not hard for us, for me… and it doesn’t mean that we still don’t want our baby. But still, I am also a wounded healer. The pastor with the achy breaky heart. The pastor who loves babies so much that it literally hurts to look at them now because it’s too painful that God hasn’t granted her this desire in her life. Baby Sunday. It makes me think what other types of Sundays/church events clergy have endured over the years that are painful. Obviously, things like church conflict (Been there, done that..).. but I’m talking more about stuff like single clergy officiating at weddings, pastors who have lost loved ones to cancer giving thanks in a prayer service for a parishioner being healed of cancer… My mind’s drawing a blank right now on more possible situations, but I’m sure they happen. I pray that God continues to give us the grace to be present, to be faithful, to be real, and to be loving… despite our own aching hearts. 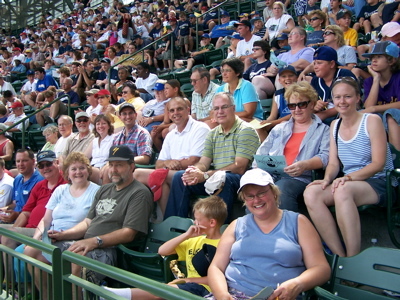 A couple of weeks ago, our District Clergy (We’re the “Badger District + Dwight”) gathered at Miller Park for the Brewer’s Game… Lots of fun.. Here are some photos. Life. It’s nuts. And good. And not always so good. Busy… returned from VT vacation, had a great time with family. 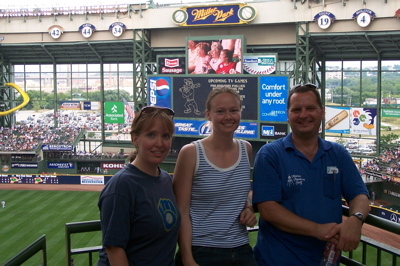 Went to a Brewer’s game with District Clergy. 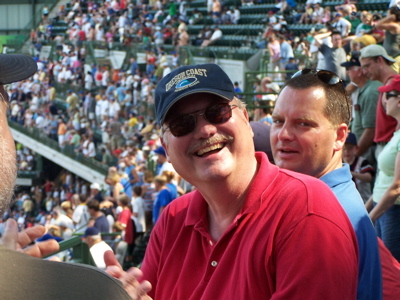 Lots of fun… Lots of church meetings lately, to work on planning mission trip (2008), interim youth ministry plans, etc. While at home and not working, we’ve been working on another vacation, thanks to frequent flyer miles. We’re going to Peru this fall. Can’t wait. Lots to do for that. Machu Picchu, here we come. High altitude, here we come…. lots of photos…. of course, here I come. Adoption? Who knows…it likely won’t happen until 2008. Can’t believe it, and yet I can. It fits with the way this whole process has been going. (the potential of it not happening until 2008 is why we’re going to Peru… need to do something fun) Others pregnant. Tough. Very tough. For us, not them. Oh well. Once again, it fits.. I’m getting numb to that. Mostly. Preaching this Sunday. Hopefully not so tough. 2 people joining the church this Sunday. Yeah. Vacation Bible School this week. Our theme is the Great Bible Reef (Augsburg Fortress), and we’ve decorated the church in underwater stuff… I love it! First night: 47 kids! (Only 11 are church kids. Interesting.) Hopefully tonight will be as many. Though it was nuts. Hopefully our new friends down the block from church will continue to come…. The dogs are good. House is a mess. Yesterday in a rare moment of domesticity–or wait, actually it was more like, the mangoes are getting too soft… gotta do something with them–, I made sticky rice & mangoes, my favorite dessert in the world. Very good. It’s been insanely hot here. Well, not as hot as farther south, but still… we ‘ve had the AC on almost every day (not 24 hours), because otherwise I can’t handle the heat. And the humidity, really. Ick. Who would guess that this girl born in Zaire would not be able to handle heat and humidity one day? Today’s slightly cooler. Tomorrow, even cooler. Yeah. Can’t wait. And now, back to life. I was on vacation in Vermont last week, visiting family. For two nights, 18 of us stayed at my parents’ home in West Townshend, and though it was crazy at times, it was also wonderful. Ok, it was crazy most of the time.. But one of the best parts is that we threw a surprise 50th annversary party for my parents (their anniversary was in June), and it was a surprise! So previous to vacation, during vacation, etc… I spent much time planning, coordinating, etc.. with the help of others in my family. 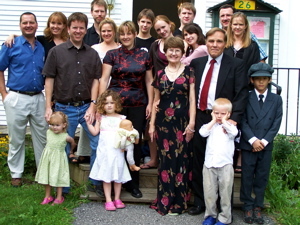 The photo is my whole immediate family. Including an appearance by Oliver Twist, aka my nephew, Chandler. Now we’re back in Madison, but life’s still crazy. We finally finished Harry Potter and the Deathly Hallows… Whew. Sad news about the Minneapolis Bridge collapse the other night. Jim’s parents are fine, so we are thankful. And we are thankful to hear about those who narrowly escaped being on the bridge, including a cousin of Jim’s. But we are sad for those who lost loved ones. more later, hopefully including photos of the 2nd Annual Badger + Dwight District Brewers’ Game.